Will Intel and Microsoft Use Netbook Lessons to Compete with iPad? Apple is winning the tablet battle in business, and the only way for the competition to succeed is to have better functionality, or to have similar features to the iPad but beat it on price. Today, laptop vendor sources are reportedly saying that tablets based on Windows 8 with Intel processors are likely to be priced no lower than $599, where iPads start at $499. Based on experience, both Intel and Microsoft know how to lower costs to compete, so will they do that with tablets to knock the iPad from it’s dominant position in the workplace? What else might make Windows 8 tablets appealing in the workplace? The rumored pricing is very similar to current Windows tablets, which aren’t exactly flying off the shelves; but, Windows 7 on a tablet isn't a particularly finger-friendly experience, either. Though we don’t yet know the specific pricing of Intel’s Clover Trail processor that will power Windows 8 tablets, or of Microsoft’s Windows 8 operating system for tablets, this situation is very similar to the early days of netbooks. While netbooks may not have been a wild success, and are now almost dead, Intel and Microsoft found ways to reduce their pricing so netbooks based on their products could compete with ARM and Linux based alternatives. With Intel’s Atom processor, and Microsoft’s Windows 7 Starter Edition operating system, each company found a way to offer a differentiated product that it could justify a lower cost to capture more market share. Tablets can benefit from a similar approach: Put a processor made specifically for tablets, together with a version of Windows, and do so at a price that can compete with ARM-based alternatives, be they running Windows, Google's Android, or even Apple's iOS. If the cost of Intel’s processor isn’t as low as it needs to be, one way Microsoft may still be able to succeed with Windows 8 tablets is by leaving Intel out, and instead run on ARM based hardware. Though Windows 8 licensing will still increase the price of tablets, using lower cost ARM processors from Nvidia, Qualcomm and Texas Instrument will help keep the cost within reach of the competition. However, it's unclear at this time just how compatible a Windows 8-based ARM tablet will be with existing software apps. Another way Microsoft could succeed would be if the features of its tablets, and the way they interact with PCs, is compelling enough to make users want to have Windows 8 on both their tablet and their PC. Right now, the main reason businesses might want, and even need Windows 8 on a tablet would be its ability to run full desktop apps. Most Windows programs are designed to run on Intel x86 processors in what will now be referred to as desktop mode; and that backward compatibility doesn't appear to be coming with ARM tablets. However, Intel Clover Trail-based tablets should have no problem running existing Windows apps, and this could be a huge selling point for companies that want native applications running on mobile hardware, and the same applications running on both desktop and mobile. Though running native x86 apps on a tablet could be a selling point for Windows 8, as long as network access is available, businesses can always use remote desktop software on any tablet to try and accomplish the same goal; but, they may lose some functionality in doing so. 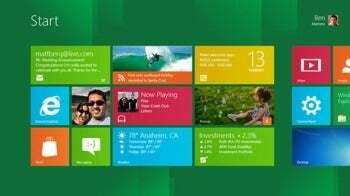 Being more expensive than the competition would likely limit the adoption of Intel powered Windows 8 tablets. If, however, both Intel and Microsoft have learned a lesson from their etbook experience, and the rumors aren’t true, the possibility of lower costs could allow them to compete based on price, which for businesses, would make all the difference.